Seeking another piece of The Rock of Yudal Kal, Mon-El and Kara discover that an entire Kryptonian city has survived within a force-field in space and Kara's mother Alura Zor-El is among the survivors! Meanwhile, back on Earth, someone is attempting to kill Alex, prompting Winn to babysit Ruby as J'onn and Alex start laying a trap for the killer and Lena considers just how far she will go to put a stop to Reign. So Kara didn't recognize any of the architecture, clothing or anything else about Argo as Kryptonian until she saw the writing on the memorial? Shouldn't she have recognized the language the people were speaking as Kryptonian? The design for Argo City as seen from space is perfect. The Kryptonian costumes are interesting. The title of this episode comes from the title of the eighth studio album released by the band Pink Floyd. In the original Action Comics which introduced Supergirl, Argo City was Supergirl's home town on Krypton. It was introduced, along with Supergirl, in Action Comics #252 (May 1959). One of the three largest cities on Krypton (second only to Kandor and Kryptonopolis) it was spared from the destruction of Krypton thanks to a force-shield built by Zor-El, brother of Jor-El. Argo City would go on to survive, until the ground underneath the city was transformed into Kryptonite. Though the people were able to delay the inevitable by lining the ground with lead, eventually this protective layer was breached, forcing Zor-El to try and save his daughter by sending her to space in a rocket, where she eventually arrived on Earth and became Supergirl. A later story, in Action Comics #316 (September 1964) said that Argo City's dome had already existed even before Jor-El warned his brother of Krypton's impending destruction and that Zor-El had built the dome as part of a measure to control the city's weather. Thankfully, it proved just as handy at providing an artificial climate when the entire city drifted into space. The Post-Crisis origin of Supergirl changed this story slightly, with the shield Zor-El and Alura used being a piece of re-appropriated Brainiac technology rather than their own creation. When Braniac detected his technology being used, he discovered Argo City and abducted its inhabitants, shrinking them and transplanting them into the Bottled City of Kandor. The DCTVU Version of Argo City also survived the destruction of Krypton within a giant force dome constructed by Zor-El. It is worth noting that the name Argo City takes its inspiration from Argo - the name of the sailing ship built by Argus, which carried the Argonauts on the quest for The Golden Fleece. Some versions of the story claim that The Argo was the first ship in history. In any case, it is a fitting name for a city set adrift. The Dark Priestess who has been guiding Reign and the other Worldkillers is revealed to be an Argo City Councilor named Selena. The main villain of the 1984 Supergirl movie was a witch named Selena. Winn retasked six military satellites to scan the airspace around the meteorite Kara and Mon-El traveled to. Argo City is protected by caretaker robots who resemble the robots in The Fortress of Solitude. Argo City is also equipped with a tractor beam that holds approaching ships. Zor-El created a force shield that protected Argo City when Krypton exploded, after Kara had been sent into space. The Black Rock of Yuda Kal is also known as Harun-El. Zor-El found a way to use Harun-El in conjunction with his domed force-field to shield Argo City from outside detection while purifying the air and generating heat. A Dar Essa is a Kryptonian flower. Thalonite Lung is a Kryptonian/Daxamite disease. It was nearly eradicated before Krypton's destruction, but reemerged in the children of Argo City. It requires the patient be hooked up to an oxygen tank at all times. Mon-El has a device, built by Brainiac-5, which acts as both a vaccine and booster for multiple diseases. It automatically detects hostile cells and deploys antibodies. It can cure any condition within one week and then be used on another person safely. Winn: And yet you seem... uh more stoic and grave than usual. Which, if we're being honest, is making me, like a little bit queasy. (stammers) What haven't you told me? J'onn: Reign is becoming immune to Ms. Luthor's synthetic Kryptonite faster than we expected. J'onn: To be on the safe side, I've evacuated L-Corp and I have a strike-team standing by with sound guns, body boots and red sun grenades. Winn: (fliply) Because that's worked approximately zero times before. J'onn: (sarcastically) Do I seem appropriately stoic and grave to you now, Mr. Schott? Alex: You want me to feel sorry for you? Ronald Collins: Why would you!? I don't even feel sorry for me! Kara: Your point is well made - that Krypton is dead. But it's legacy lives on. For good and ill. My own mother sentenced prisoners to Fort Rozz. Prisoners who broke free and took their anger out on Earth. Many of whom we're still trying to apprehend. There are people on Earth who work every day to solve the mistakes of Krypton's past. People who are trying to make Earth fairer. Or just better. These people dedicate their lives to this work. And some have even given their lives to it. This planet... these people... they took me in. An alien immigrant from a world they knew nothing about. A world whose legacy threatened their way of life and their safety again and again and again. And now, they deserve it in kind. Because their very existence is threatened by this World Killer of Kryptonian making. My mother tells me Argo City has changed. That it has learned from the mistakes of Krypton's past. So I beg you... give us the gift of Harun-El. We don't need very much. And this bit of charity... it will save Earth. Ruby is considering becoming an astronaut. Alex teases her about how she gets motion sickness too easily for that but Ruby counters that only happens when Alex is driving. Someone attempts to kill Alex with a grenade while she's taking Ruby out for ice cream. Reign is now able to see and hear through the refractive scatter field in her cell from 319. According to Mon-El, The Legion of Superheroes don't bother with secret identities. Alex got Ruby a book on Ada Lovelace - the first computer programmer in history. Winn runs through a list of people with a grudge against Alex. This includes Griggs (215), The Hellgrammite (102) and Hannibal (217). Alex responds that Griggs and Hellgrammite are still locked up and Hannibal was deported after the Daxamite invasion. Winn guesses it might be Rick from 219, until J'onn reminds Winn that he mind-wipped Rick. Alex guesses that the assassin might be Ronald Collins - the murderous sheriff from 306. He is said to now be 56 years old and was let out on parole after six failed attempts. By a strange coincidence, Ronald Collins moved to an apartment six blocks away from Alex's upon being release from prison. Kara realizes that the strange city she and Mon-El discovered is Argo City. Argo City was mentioned in 119 as the site where Astra attempted to test Myriad. Alura explains that the last she saw of Kara as a child was her pod being knocked into The Phantom Zone. Kara explains that she was there for a time but that she eventually made her way to Earth along with Fort Rozz. Alura recognizes Mon-El as The Prince of Daxam. Mon-El says there is no more Daxam. Alura says all that remains of Krypton is Argo. Following the destruction of Krypton, ashes and destruction poisoned the air within Argo's dome. The young and the elderly became sick because of the new atmosphere. Kara recognizes the structure they track The Rock of Yudal Kal to as a Kryptonian memorial. Alura tells Kara that her father died in his efforts to save Argo City. Argo City is ruled over by a High Council. Alura is one of the councilors. Alex confronts Ronald Collins. He claims to be innocent of trying to kill Alex, saying that he deeply regrets what he did. Alex's new motorcycle from the last episode is blown up by her would-be assassin. A Dar Essa is a Kryptonian flower. Kara had one in her bedroom when she was young - a gift from her grandmother for her first birthday. Her father used it as a guide for measuring her height. Kara was tall for her age and quickly outgrew her Dar Essa. Alura describes Fort Rozz as her deepest shame. Kara tells Alura about the events of Season One, her battles with the Fort Rozz escapees, her aunt Astra and her Uncle Non. Alura says the people of Argo now look to their past for edification - not a blueprint for how to do things. Mon-El gives a vaccine device to the merchant from whom he stole clothing upon first arriving in Argo City, testing it on her ill son and apparently curing his lung disease. James talks to Lena about how she can kill Reign with a Kryptonite overdose now, but that would kill Sam as well. James asks what Sam would want and Lena says that she'd want her daughter and the world saved, no matter what. Winn talks to Ruby about his murderous father and how he shares her fears about there being something bad inside him just waiting to come out. Alex and J'onn set a trap for her assasssin, with J'onn posing as Alex. The Worldkillers are figures of legend to the people of Argo. Alex's assassin is revealed to be the identical twin brother of an alien criminal she brought to justice once. He was a Fort Rozz escapee who killed 12 people. Their species is not identified by name, but they are from Naja Falk 7. They have a strong sense of smell which allowed him to distinguish between J'onn and Alex from a distance. The High Council of Argo City agree to give Kara some Harun-El. Alura gives Kara a box before she returns to Earth. We do not learn what is inside it. Alex talks with J'onn about how she can reconcile her inner adrenaline junkie and her nurturing side. Alex refers to the flashback in 117 and how J'onn approached her about joining The DEO at a time in her life when she was a bit of a mess. Selena - the councilor who broke the tie to give Kara The Rock of Yudal Kal - is revealed to be The Dark Kryptonian Priestess who has been influencing Reign and the other World Killers. Lena attempts to use her kill-switch to destroy Reign. It doesn't work. 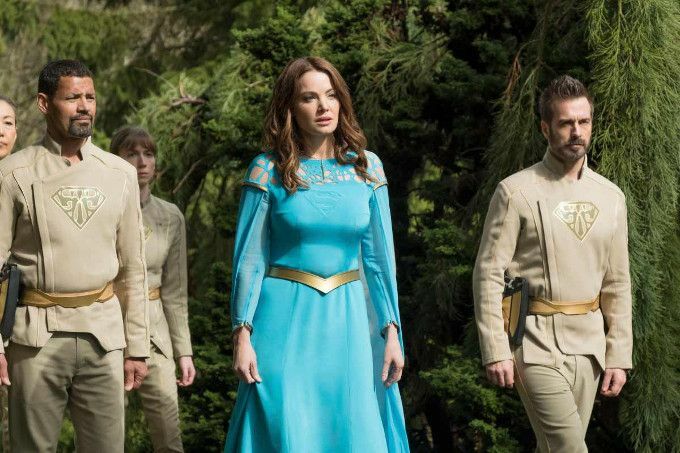 The episode ends with Kara and Mon-El arriving just as Reign breaks free of her prison, and Kara engaging Reign as Mon-El runs to Lena with the Harun-El. Zor-El is revealed to have sacrificed himself in some manner in order to provide for the people of Argo City with his research. Generally good, but it feels like there's a bit too much going on or, at least, that there should be more focus on the fact that a whole Kryptonian city is still intact and Kara's mother is still alive. The Kryptonians, in turn, don't seem at all phased by two strangers entering into their city who turn out to be a Daxamite and a Kryptonian from another world. It's all very muted and it doesn't help that we keep cutting away to Alex dealing with a mystery assassin, Lena wondering if she should try to kill Reign now and Winn babysitting Ruby. Ignoring that, the performances are all top-notch and the cliff-hanger is one of the show's best.